I won't lie...I was really excited when I started this book. 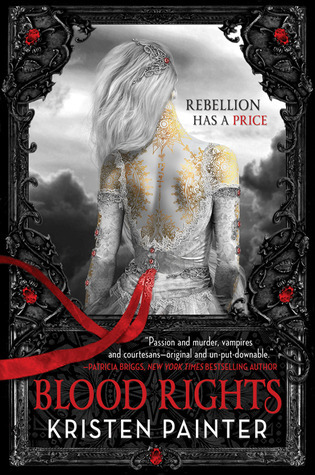 I mean, here we have a vampire book that is different from all the other vampire books out there. In a sub-genre that's as flooded as the vamp one...that is quite a feat. Kristen Painter paints (no pun intended) a vivid world where comarrés are bred and raised for the express purpose of feeding noble vampires. Living her whole life in this form of slavery, Chrysabelle is ready to flee her master and escape her gilded cage...only to find, on the eve of her escape, her master murdered in their home. On the run and suspected of murder, Chrysabelle teams up with a rogue vampire named Malkom as they uncover a political web of lies that aim to tear down the veil that has been hiding the existence of supernaturals from ordinary people.